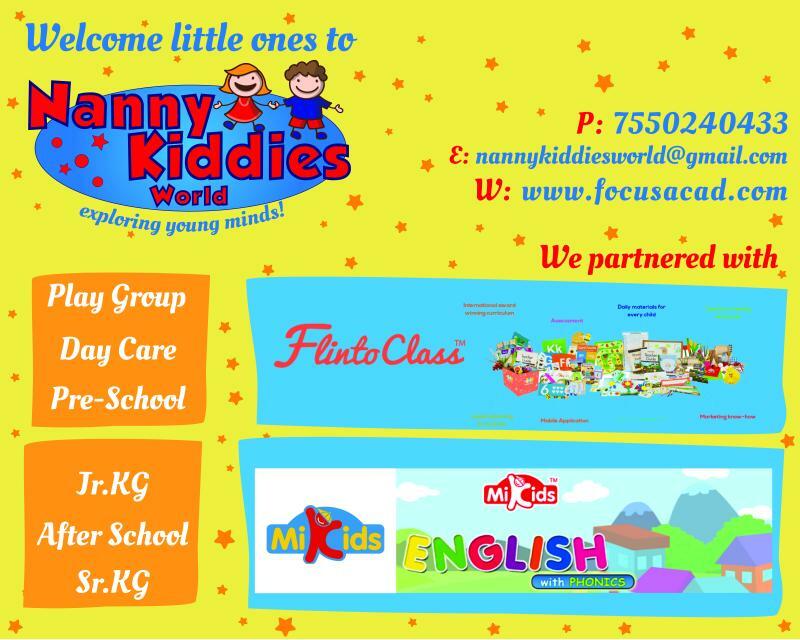 Nanny Kiddies World, Rajakilpakkam | NKW Mission : Exploring Young Minds to Excel !!! NKW Vision : We inspire curiosity independence and a life-long love of learning to help our children become contributing members of our community and the world. NKW Mission : Exploring Young Minds to Excel !!! NKW kids are focused on early child development systems. It is a high-quality, research based, child-centric early learning program. The curriculum is based on the psychological theories of development that offers a stimulating learning program for children to explore and learn the guidance of teachers. The curriculum is highly structure, incorporating sessions necessary for holistic development of the child focus on both structured and un-structured play. Apart from the above, we do provide a starter Kit for each child which involves Hand Puppets,Safe Scissors, Aprons, Play Dough, Crayons and Play Brooms. We also provide a Phonic-based International English Learning Programme for our Jr.kg and Sr.kg kids that you have been waiting for to make your children read and speak fluently in English. It has been designed to impart speaking and reading skills, for the young learners. With the Perfect English Guidance, Your kids will become independent readers at a very young age, learn to speak with proper pronunciation and intonation, and build a powerful foundation in English. It is conceptualized and developed by the renowned British linguistics expert with a vision to improve English Standards.